【THE VARIETY OF SIZES MAKE FOR ENDLESS FUN】-Great bunch of rope toys for dos, pet, puppies to entertain, no worries that they would be lonely when you are not beside him or her. 【COTTON BRAIDED NONTOXIC PET KNOT TOYS FOR SAFE PLAYING】-These knot toys set are made of premium quality natural cotton fabric, which are very healthy and safety for your pets. Colourful knots attract pets' attention easily with endless hours of chewing fun. The special cotton rope bone helps the healthy development of the teeth and gums of pets. 【NO WORRIES THAT YOUR PET CHEWING FURNITURE, TABLES AT ALL 】-the chew toys keeps him away from chewing everything else like the table, plants etc.The tassels on the end of the knots can be used as excellent dental floss. 【ENHANCING THE INTERACTIVE RELATIONSHIP BETWEEN YOU AND YOUR LOVELY FURRY FRIENDS】-these interactive dog toys satisfy dogs' instinctual needs to keep them be active with a healthy state.Flying disk and cotton ball are good for them to do exercise training. 【THESE KNOT TOYS ARE DESIGNED FOR SMALL AND MEDIUM, LARGE PETS】-Vibrant colours and perfectly sized knots attract them a lot to play with, excellent selection of rugged chew toys for your furry friends or dog lovers as a gift. 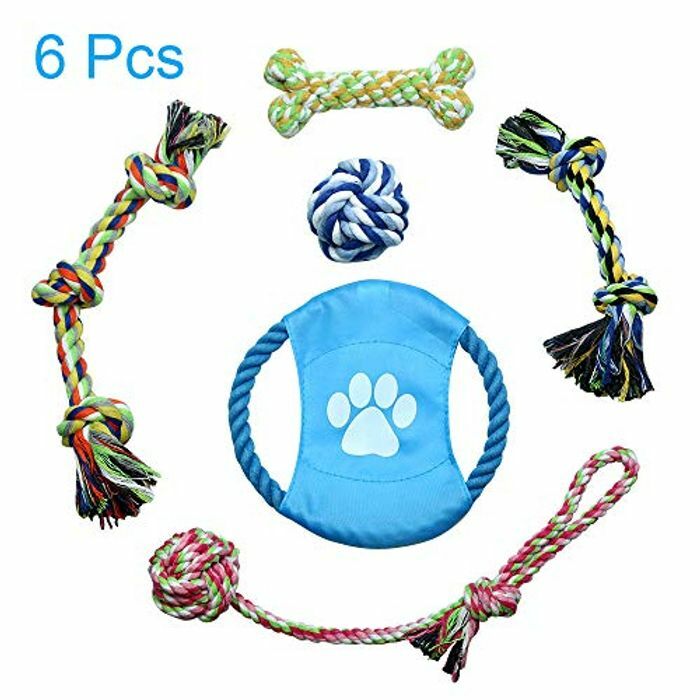 6 Pcs Pet Rope Toys is the best gift for doggies, puppies and cats, arouse their instinct of chewing, playing and help dog's mental development and get much more entertainment, no need to worry that they would bite everything in house, also to train them to be healthy. ☆These dog toys are interactive toys, ropes toys, chew toys, frisbee toys, knot bone, dog balls. All of them are very attractive to meet different requirements for your dogs. ☆Some of the pets are inactivity and look a litter lazy. These toys keep your dog to jump and run during the exercise time. Do more exercise keep your pets be healthy and beautiful figure. We have 69,325 Amazon deals and 756 Amazon discount codes on Latest Deals.